Homemade Michelada Cerveza Preparada | Kitchenpants! There are many, many ways to cure a hangover: painkillers, water, sleep, eggs (true story), kombucha (truer story), a good run (truest story ever), and, of course, a little hair of the dog. Usually, hair of the dog comes in the form of a Bloody Mary (no, thank you), but it can also take the form of the Michelada. The Michelada came into my life on spring break in Acapulco on a sunny morning at the pool after a late night on the town (read: Four girls with massive hangovers gathered by the pool to piece together the previous night and we needed the aforementioned hair of the dog.) A Bloody Mary wouldn’t do for me, so the Michelada it was that morning and for most of the mornings to follow. This blend of beer, lime, and tomato juice is a little miracle in a glass. It’s been a long while since I have had a solid hangover, but if the occasion arrives (ahem, Shanda…NOLA!) I will be ready and so will you! 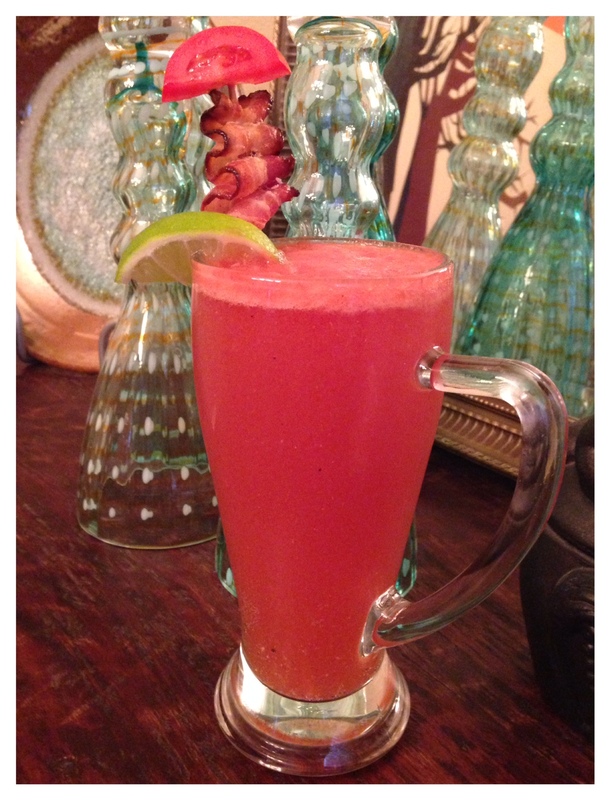 Here’s my recipe for a homemade Michelada. 1 Jalapeño – Use more if you want more heat in your Michelada. 1 1/4 Cup Chicken Broth – You can use vegetable broth if you like. 2 Tbs. Clam Juice – Find this in the same place that you find canned tuna at the grocery store. 1 Tbs. Oyster Sauce – Find this where you find soy sauce at the grocery store. 1 Lime – You might want to have a few more on hand for serving. Beer for Serving – See below. 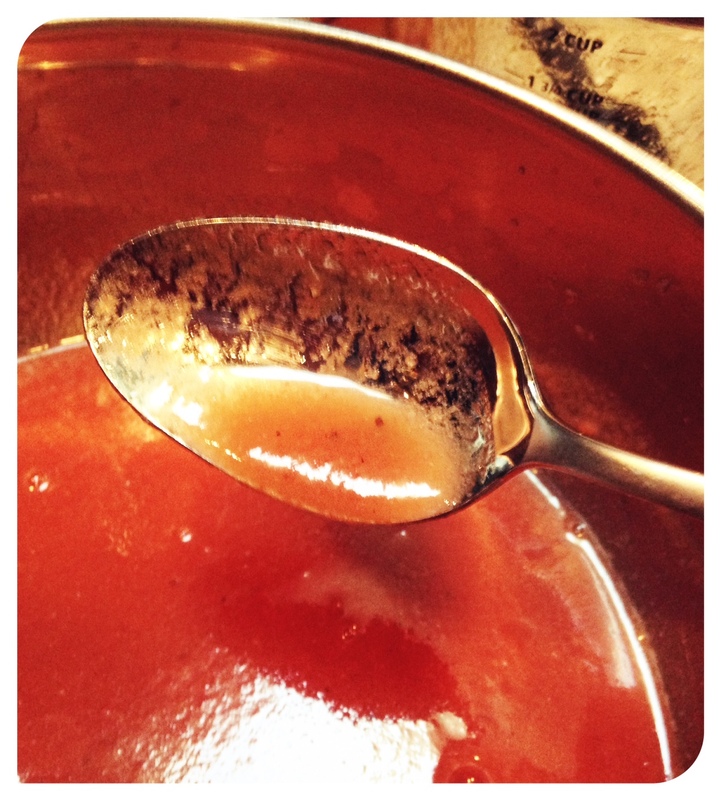 Skin the tomatoes: Fill the stockpot a little more than half-way with water. Heat it on the stove until the water boils. Place the tomatoes one at a time into the boiling water and let them hang out there until the skin begins to break apart. Scoop them out and peel away the skins with tongs. While the tomatoes are still hot, sprinkle them with sugar and set them aside. Slice up your jalapeno and onion. It doesn’t matter how you slice them as you are going to blend them up later. Heat the skillet over medium heat and add a splash of olive oil (just a splash – no more than a teaspoon). Place the onion and jalapeno into the skillet and heat a few minutes. Add your tomatoes* to the pan along with the chicken broth and heat until everything is soupy. This should take about 20 minutes, but it varies. Stir occasionally to ensure that nothing sticks. Add salt and pepper to taste as the mixture cooks. I usually do 6 good grinds of pepper and a pinch of salt at this point. Add the white pepper here as well. When the mixture is soupy, remove it from the pan and place it into whatever blending device you use. When the consistency is right, add the clam juice, oyster sauce, the juice of 1/2 a lime (to start – you may want to add more later, but you don’t want to get too limey too soon). Whisk everything together and taste it. Add pepper and salt as needed. I usually end up adding another 6-8 grinds of pepper here and a smidge of salt. Add more lime juice if needed. Note, though, that in the end preparation, you will probably add even more lime so I recommend being slightly conservative here. Let the mixture cool and then refrigerate it for a few hours to let the flavors blend together. When you are ready to serve, grab a tall beer glass and squeeze a wedge of lime into the bottom. Add 12 oz of beer (your choice, but use a lighter beer for this – Corona, Modelo Especial, Pacifico Clara) and 4 oz of the Michelada mix. Stir carefully. *If you like the taste of raw tomatoes, you can leave the tomatoes out here and add them to the blender when the onions and jalapeno are done. This will make the mix taste a little more – well – raw. I’ve done the recipe both ways and the raw way isn’t bad, but I prefer the tomatoes cooked. One of my best buddies contends that “there’s no point to lettuce!” and I feel the same way about large raw tomatoes…blech.